A man was shot in the leg while attempting to rob an off-duty NYPD officer in Brooklyn Monday night. 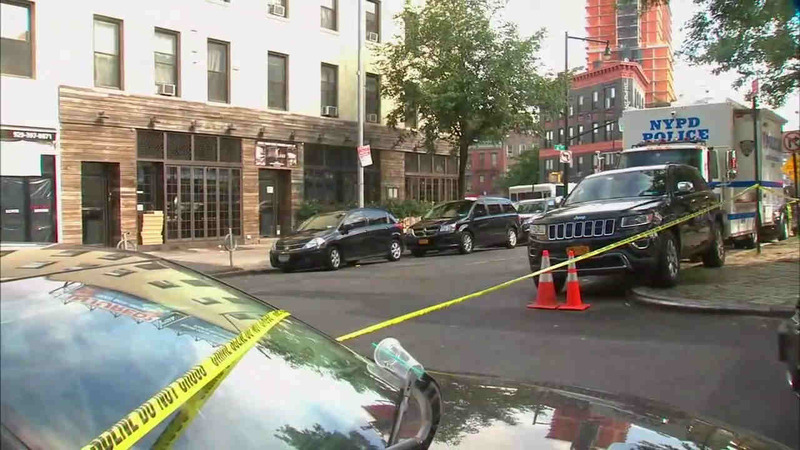 PARK SLOPE, Brooklyn (WABC) -- A man was shot in the leg while apparently attempting to rob an off-duty NYPD officer in Brooklyn Monday night. Detectives are trying to determine who fired the officer's service weapon while he and his cousin were being held up outside Bleachers Sports Bar in Park Slope. Authorities say two suspects, one armed with a gun, are believed to have approached the men just after midnight. During the gunpoint robbery, the officer's weapon was fired, apparently in self defense, but it remains unclear if it was fired by the off duty officer, by his cousin or by the suspect during a struggle. One of the suspects, a 32-year-old man, was struck in the right leg. He walked into Methodist Hospital about an hour later, according to investigators. The weapon was found in the officer's trunk, and he and his cousin are being interviewed at the local precinct. The suspect is being treated at Methodist Hospital. No charges were immediately fired. Police are still looking for a second man who fled the scene.